Despite several recent victories for lovers of local architecture, several seafront blots serve to remind us that there is much to do before we can relax. The King Alfred, the West Pier and the delightful Birdcage Bandstand have all been allowed to rot over a disgracefully long period by the powers that be despite overwhelming public pressure for action. 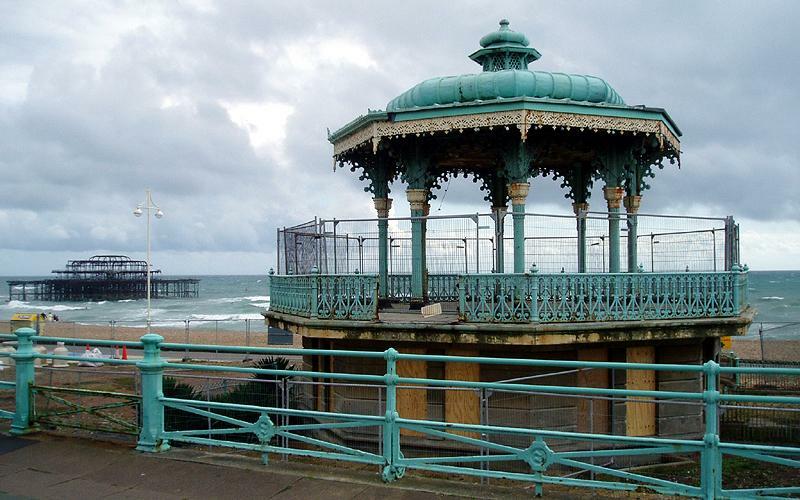 The Bandstand was designed by Philip Lockwood and built in 1884 as part of a project to improve the facilities on the seafront which included landscaped enclosures and covered shelters. It sits graciously in front of Bedford Square despite being in need of urgent refurbishment. When it was unveiled, the nearby Grand Hotel had already opened but the Metropole didn’t arrive until several years later. Motorcars would not have drowned out the brass bands as they would do today if the Bandstand wasn’t too dangerous to accommodate human beings. An octagon of ornate arched poles supports the Bandstand’s oriental dome. It was nicknamed the ‘birdcage’ for obvious reasons. A delicate balcony encloses the performance area which sits on a raised base which originally contained public toilets. The iron, like much of Brighton’s municipal ironwork, came from Lewes. It was Grade II Listed in 1971 and amazingly attempts were made in the past to actually remove the building permanently. That aim has nearly been achieved by inaction as today, the Bandstand rots and large portions of its roof have blown away. 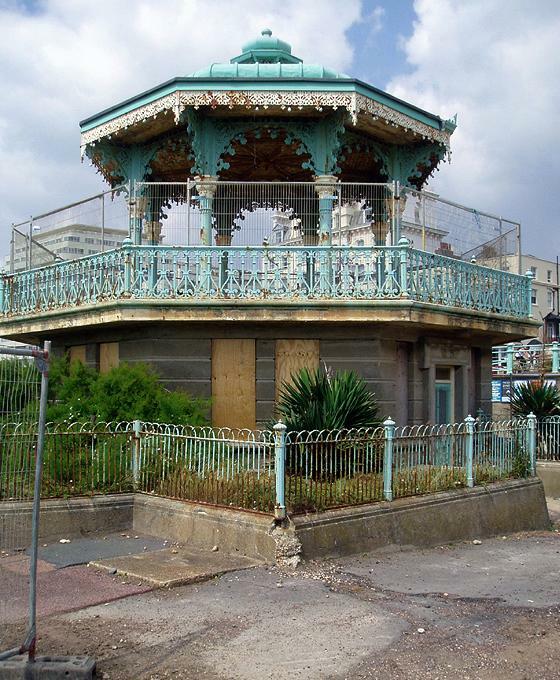 On close inspection of the derelict structure, a sign on the metal fence may be read which states: “Brighton & Hove City Council has applied to the Heritage Lottery Fund for a grant to help restore this magnificent bandstand to its former glory. We expect a decision on the grant in early 2006…The aim is to make the Bandstand one of a string of focal points and attractions for residents and visitors to enjoy along the seafront…For more information contact the Environment Department on 01273 292724.” It’s now nearly Autumn. Perhaps a call to the Environment Department will speed up the process. The Birdcage Bandstand was built for brass bands but, inevitably I believe, imaginative new uses will have to be found – anything to stop it from falling into disuse again. We’re all hoping that we get the grant from the Lottery but if we do not, another source will simply have to be found – it’s just a question of willpower.